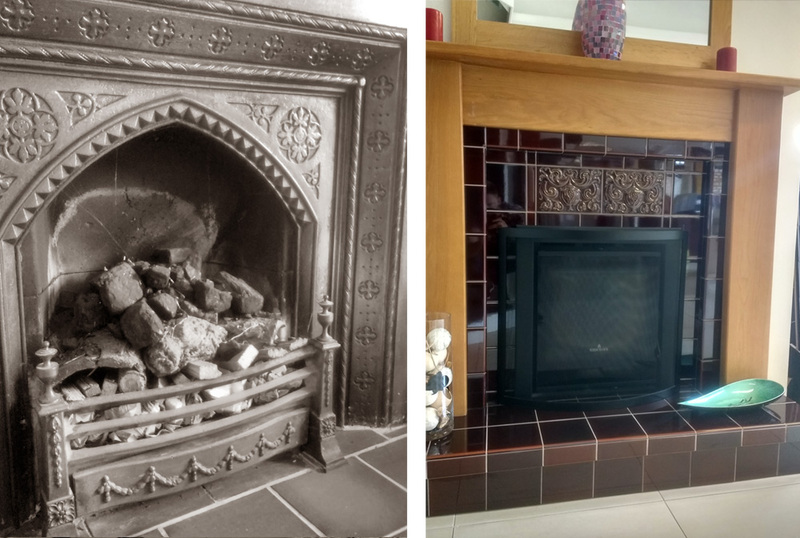 From the cast iron fireplace to the tiled fireplace, H&E Smith reflect on the changes to fireplaces over the last two hundred years. Fireplace tiles have been used for many years. The Victorians used them in cast iron grates, the Dutch were using them in Inglenook fireplaces. They were used and were popular in expensive properties throughout Europe as a perfect material with which to frame a fireplace. This was due to the refractory nature of glazed tiles and the fact that they are easily cleaned as well as for their aesthetic beauty. H&E Smith Ltd fireplace tiles are extremely durable so they are able to retain their beautiful aesthetic appearance for many years. From the Victorian era onwards, it had been Government policy to provide housing stock with the facilities for heating, cooking a meal and boiling hot water. The cast iron range had been the perfect solution for each of these three requirements. As a consequence, many old Victorian houses included a cast iron fireplace. An interesting note is that a good number of cast iron fireplaces also incorporated left and right panels designed to accommodate 5-tile panel sets. These flashes of glazed colour enliven the design from the plain black metal to a more opulent and vibrant look. Fireplace tiles became far more popular during the 1920s when the cast iron fireplace went into a sudden decline. This decline set in primarily because metal was required for the war effort as a result of World War One. 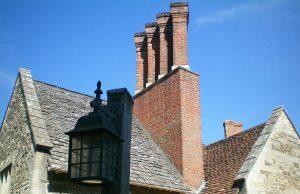 The United Kingdom Government had changed their policy of providing a cast iron fireplace to their housing stock in response to this shortage. 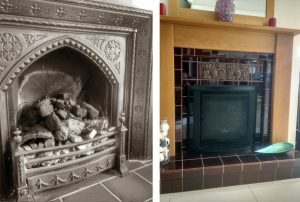 From this time onwards, instead on installing a cast iron fireplace they looked at other options for installation in their housing stock. What became apparent was that the houses were built with and Inglenook where the range would normally be set in. A more effective solution became clear – with the available space, they were able to put a back boiler system in which would also heat the water and provide central heating within the home. This solution was an early form of central heating. In front of the back boiler, a return to wall fireplace would then be installed which did not require a mantel. 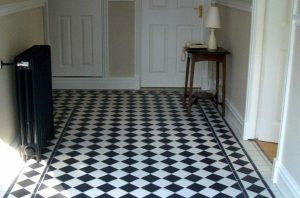 This would be constructed using a method called Slabbing which used a large volume of fireplace tiles. “Slabbing” was the process often used to create fireplaces and hearths in which the fireplace tiles were laid together upside down on a workbench.The fireplace was then filled in from the back with lightweight concrete with steel reinforcing bars then when the concrete had set, the completed fireplace was lifted from the bench and was finally grouted. There was a huge swing away from the traditional cast iron fireplace and towards in the use of fireplace tiles for reasons of both practicality and fashion during the period from the 1920s right up to the Second World War. Fireplace Tiles continued to be popular after the Second World War, through the 1940s and 1950s and they started to dwindle in popularity with the growth of marble fireplaces. People moved to materials from Europe and 1960s fashion statement might have been to have a slab marble fireplace. 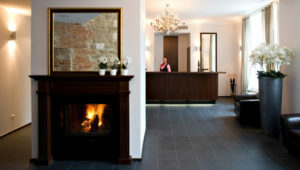 H&E Smith provided these types of fireplaces during this period to meet customer demands. The marble fireplace gradually declined as a product for a number of reasons. Marble is a natural material with a natural graining in it that would open up causing fissures to open up in the surface under the intense heat of a natural fire. One distinct advantage fireplace tiles have always had over other fire surround options is the ability to replace a tile if it is broken. Obviously the area surrounding a fireplace is a high-stress area where metal pokers can fall over, the fire may spit out hot coals or wood that might not have dried properly and marks and damage could appear on the surface. With tiled fireplaces this is not a huge problem as replacement tiles can be easily and cheaply bought but it is a very different order of cost and effort with a large slab of marble or granite! 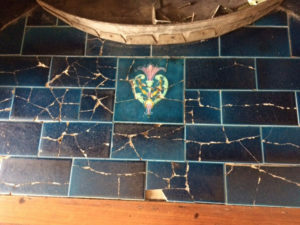 A black tiled hearth is easy to clean, looks appropriate and anything that may drop out will fall onto a surface that is non-combustable and won’t leave a mark or damage. 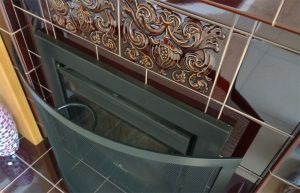 In this respect, fireplace tiles are a great solution for a fire surround. Whilst a thin 6-inch ceramic tile will not be as strong as a thick traditional 12mm quarry tile or an 8mm porcelain tile. The fireplace tiles we have manufactured have always been ceramic, though of late H&E smith have moved towards an earthenware body that has performed very well. Compared to a standard 6-inch ceramic tile, H&E Smith fireplace tiles are both thicker and stronger. 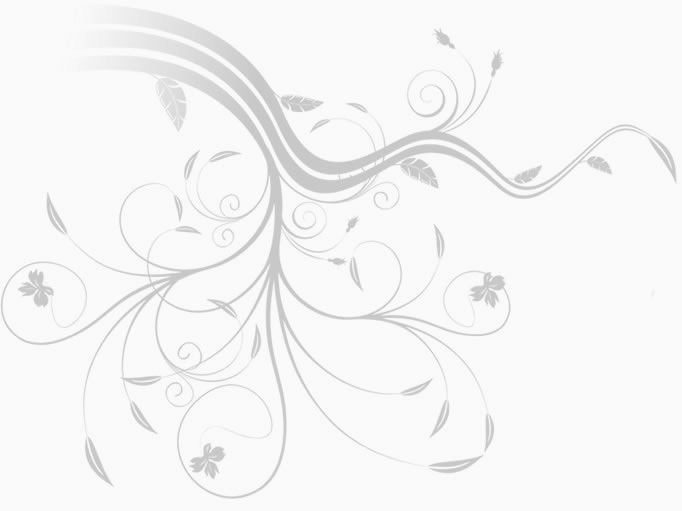 Wall tiles tend to be thinner and weaker. 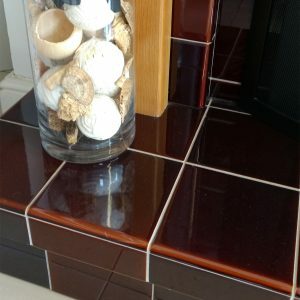 Fireplace tiles as opposed to traditional ceramic tiles come complete with tiles specially designed for the edges of the fireplace, with rounded edges on both the RE and REX tiles which make the effect of the hearth tiles look much better. Whilst we supply these tiles in a wide range of colours, over the years we have noticed that certain favourites have emerged. Our popular colours include Basalt Black, 942, and the traditional favourites of the Victorian era, Teapot Brown (as shown in the image at the top) and Victorian Green. Today, despite these advantages for homes which are regularly heated with solid fuels, many fireplaces are given pride of place in homes that don’t specifically require them for those historic reasons of heating and cooking. Many houses and flats are built without any focal area in their living rooms, but people still like a focal point in a room. 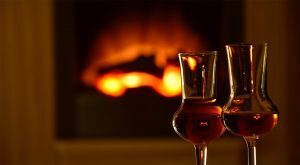 Even in a world where technology has moved on and central heating is now the norm for many home-owners, there is still nothing quite like gathering round a real fire, feeling the heat and watching the flames rise at the end of a day.